Name recognition is one of the most important skills for preschoolers to learn. But just because a preschooler can identify their name doesn’t exactly mean they can spell it. These name practice sheets do both. They teach recognition and name spelling. Of all the skills kindergarten teachers like preschoolers to have upon entering elementary school, they like it best when children can identify their own name. It just makes the school day so much easier. From finding their seats to finding which cubby to put their coat in, kinder teachers really appreciate it when preschoolers can read their names. But they also appreciate it when preschoolers can spell their names, too. The reasons are two-fold. For one, the children can more easily write their names on any papers at school if they can already spell their name. And two, if they can spell their name they can most likely identify the letters in their name, which means that those preschoolers entered kindergarten with just a little bit more alphabetic knowledge. At the preschool level, teaching children to spell their names has many benefits. At this age children are really self-centered and they love their own names (and the names of their friends, too). This motives them to learn more and about other things. Including names around the classroom is an easy way to incorporate more literacy into their environment. In addition to that, when preschoolers learn to spell their names they are also learning the letters in their names. If done properly both the letter name and the sound. And this is a great thing! 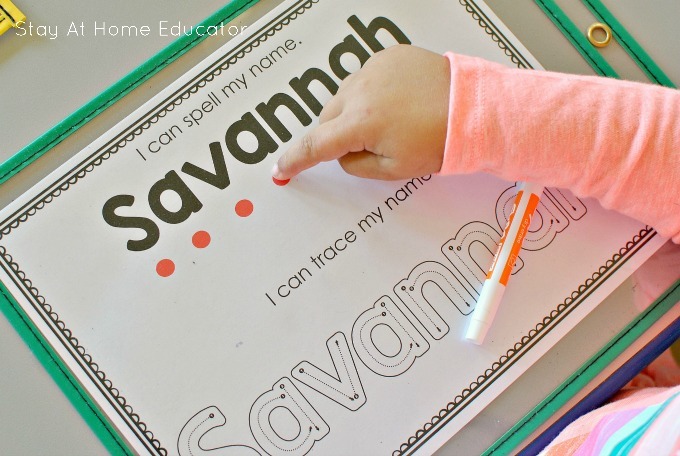 There are tons and tons of ways to teach preschoolers to spell their names, and I recommend using a variety of strategies to prevent children from getting bored. 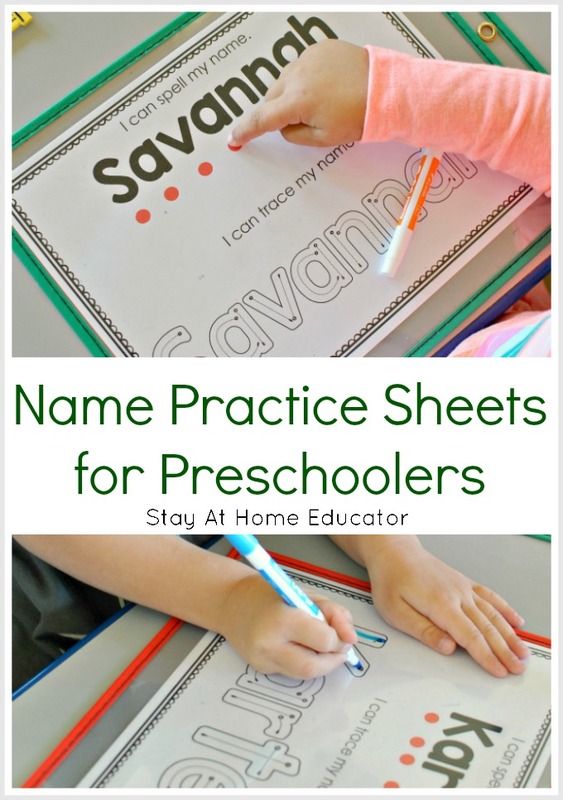 This is one way I teach my preschoolers how to spell their names – with name practice sheets. Upon arrival, my preschooler complete their name practice sheet. It replaces the idea of using a sign-in sheet. For these name practice sheets, I used a lot of clipart and specialty fonts, which I will link below. As I explain the activity, I’ll also explain how to make the name practice sheets. 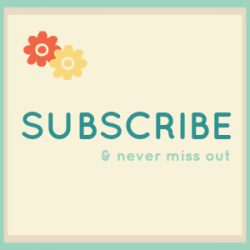 They are super simple and really effective. When my preschoolers come in each morning, they find their name practice sheet at the preschool table. One side has their name in the KG Red Hands Outline font with some tracing lines clipart. This side gets changed up several times a year as the children become better and better at tracing the lines. At the beginning of the school year I start my preschoolers out simple lines and change them out for sheets are increase in difficulty. They go from straight lines, to wavy, to zigzag and finally at the end of the year they might progress to loops and such. This clipart is perfect for creating individualized pre-writing practice sheets. I added a red dot on the left side of the line so that my preschoolers learn that when we write we always start from the left and go right. It also helps them make this connection in print awareness and reading. We use these dry erase puches . They wipe-off so well! And little knit mittens the best erasers! Once my preschoolers have finished tracing the pre-writing lines on the one side, they then color in their name at the top of the page. The font I used for this is KG Red Hands Outline. When the first side is finished (it only takes them about five minutes at most) they flip it over to their name practice sheet. There is a very specific way I use them. First, before anything else I read their name and then model for them how to spell it. I used the KG Red Hands Font again and added red dots under each letter. As I say each letter, I put my finger on the red dot under it, showing the children how each letter has it’s own name. One-to-one correspondence in reading is just as important as it is in math. Then, I ask my preschoolers to try it out for themselves. 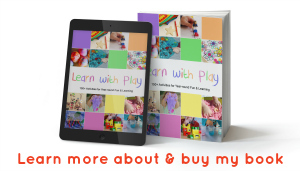 The most important thing, initially, is that the child is learning one-to-one correspondence. They will pick up the letters in their name as they practice, but I really watch to make sure they point to each letter as they make an attempt to say it. If they don’t remember, no worries, I remind them. We do this part if our name practice sheets every single day. By the end of the school year, they can spell their names! The final part of the name practice sheet is the name tracing at the bottom of the page. I don’t focus a lot on correct letter formation unless the child is really, really interested in writing and is really ready to practice writing. Instead, what I focus on is the concept that letters are formed from top to bottom. As they become more familiar with letters, we then start focusing on forming letters from left to right. (Although now there are many writing programs that don’t emphasize that at all). The clipart I used for the tracing letters is this set. I like it for a few reasons. First, I like that the tracing lines are inside a block letter. It gives preschoolers a better visual of the letter. And the other reason I like this set is that each letter does have a number order of where each stroke of the letter should start. My preschoolers don’t pay much attention to this, but it works great for kindergarteners. Use a program like Powerpoint or Publisher to create these. Those programs allow for much easier movement of the clipart than something like Word. Just trust me on this. 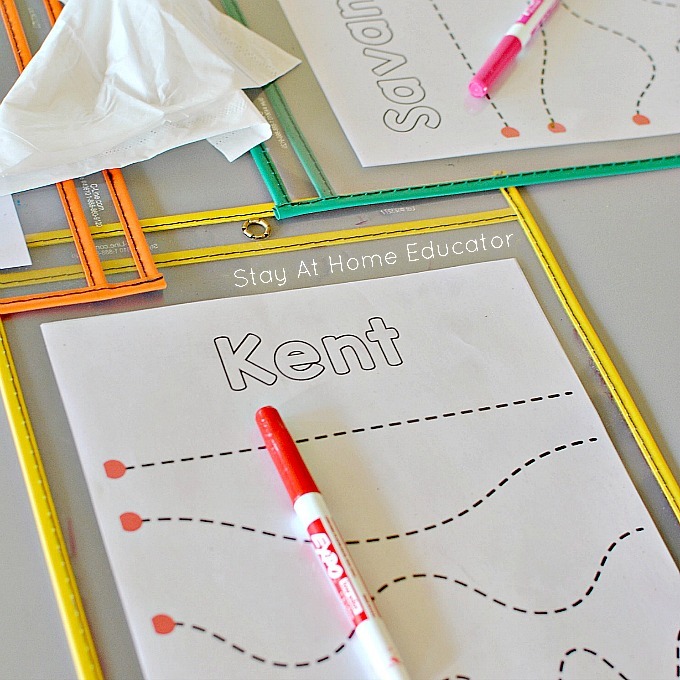 Make a second copy and laminator for the children to practice at home. Don’t forget to send a dry erase marker with it! This is really well thought-out, and I think I’ll use it with my kindergarten RtI group! Which border pack did you use to outline the sheets? Thank you! My favorite clip artist for boarders is Rebecca B. Designs. 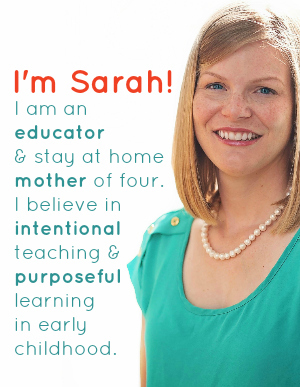 You can find a lot of her work on Teachers Pay Teachers. 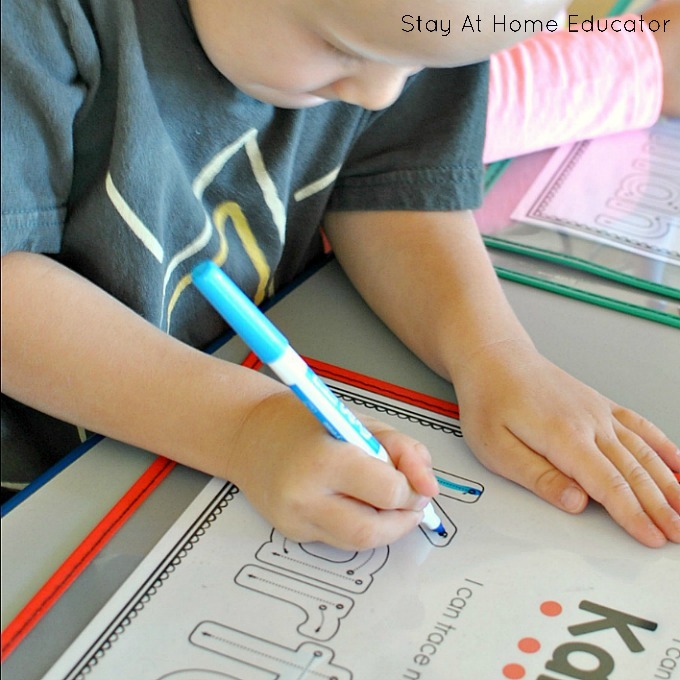 Where did you purchase the item where the kids will write over the clear surface? I love how that is an alternative way than using a regular white board. I was wondering if you sold this as an editable copy somewhere? Thanks! I can’t sell it as an editable copy because there is no way to secure the letter clipart, and not securing the clipart is violating the artist’s terms and conditions of use. I’m sorry. I am unable to get a copy of this. Is it available in TPT where I can purchase it from you? Because the name letters are actually clipart and not a font, I cannot provide an editable document for purchase, which is why I have linked to the clipart I used, instead. Hello! I’ve not been able to successfully access the name writing pages. Am I missing a link? Thank you for sharing your work! No, you are not missing anything. Unfortunately, these are not a free printable. Reason being is that the tracing letters are individual clipart, not a font. Instead, I have linked to the clipart I used in the materials section of the post. How exactly did you get the letter clip art to spell out the student’s name? Were do I get the red dots from? The red dots are just a shape you create in your document. If using PowerPoint, go to >insert > shape and select circle. Then you can create it to your specifications.